After several weeks of #BikeDC Speaks posts from the women of the #BikeDC community, we are back this week with a guy’s point of view on riding in the D.C. area. Chris is another familiar face from #FridayCoffeeClub and, if you ride along MacArthur Avenue, you may spot him there as well. During his years of commuting in the area, Chris has observed and learned a lot about cycling in the city. AND as a new parent who hopes to have his daughter accompany him on rides, I thought he would make a great guest contributor. Without further ado, here is Chris’s take on riding in D.C. I moved to D.C. in 2004 for graduate school and started using my girlfriend’s bike to get to and from class pretty much immediately. I did this until her bike was stolen while I was in class one evening. We’ve since married, so I don’t think she held it against me. After about a year’s hiatus, I inherited one of her father’s bikes (1978 Schwinn Super Le Tour 12.2), resumed riding, and have been since. As of this year, I’ve been a year-round daily bike commuter for about six years. I’m lucky enough to live close to work so I commute exclusively by bike. Off an on over the years I’ve done group rides and solo long rides. Living on MacArthur Blvd means I have an easy route out of the city (with all the other cyclists!) whenever I want to ride some miles. More recently, I acquired a trailer for my daughter (15 months old) to start joining me on rides. The first ride -only about 10 minutes- was a success, but it’s going to take some time to get her comfortable with a helmet! While up in New York recently, I was struck by just how far you have to ride (or drive with the bike on the rack) to get out to ride low-traffic country roads. There are plenty of in-city routes, and you have some good park riding, but to really log some miles you have to make an effort to get out of town. By contrast, I think that D.C. (and Northern Virginia) offers the best of both modes. There is lots of riding to be done within the city for a relaxed summer evening ride, and it’s also really easy to quickly leave the city behind (on two wheels) and ride some really pleasant roads through Virginia and Maryland. But you don’t have to get out of town to enjoy riding in the District; the residential neighborhoods offer plenty of low-speed side streets for relaxed riding. If you can avoid tourist traffic, the Mall can make for some pretty spectacular sight-seeing on two wheels. Several stretches of trail/road along the Potomac and Anacostia rivers also give a unique experience. The fact that both the train station and National Airport are easily accesible by bike is a claim that not a lot of other major cities can make. I don’t spend a lot of time riding busy streets other than those between my Foggy Bottom/West End office and home, although none of the streets that I do ride on regularly have sharrows or dedicated lanes (yet). Mixing with cars on a daily basis has taught me to be a good deal more patient – and this goes for riding on the local multi-use paths (MUP) where there are pedestrians, such as the Capital Crescent Trail and Rock Creek. One other difficulty that I’ve experienced lately is inter-trail signage. That is, finding signs to point you to nearby trails when you’ve reached the end of the one you’re on. Riding in Arlington recently has made me aware of the lack of signs here in the District. All of that said, I can’t say very much comparatively, as I have limited experience riding as an adult in other cities. 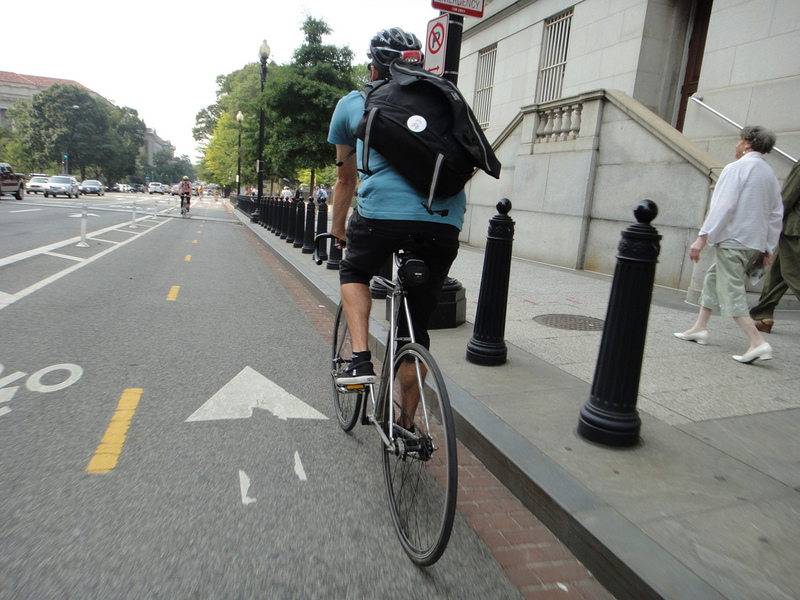 Things I see as challenges may be something that we D.C. riders take for granted compared to cyclists elsewhere. Chris at #FridayCoffeeClub. People, it’s time to go to our jobs! Generally the Palisades (MacArthur Boulevard) is friendly, if for no other reason than being used to lots of riders. The expansion of CaBi stations throughout the District and Northern Virginia has the potential to increase goodwill towards cyclists. Another sign I keep an eye out for are quirky/fun bike racks. If a property developer (or DDOT) is willing to spend a little bit more on a non-standard issue bike rack then I’ll take it as a good sign. Even better are the unseen bike parking facilities. Any employer that has dedicated bike spaces (with extra security) and showers/lockers in their building is a step ahead of most. Many of the things that DDOT is already working on will continue to improve the landscape: more dedicated lanes and separated lanes better signage. My longtime personal gripe to DDOT is about the lack of a “No Outlet” sign on Water Street heading towards the Capital Crescent Trail in Georgetown! Where it makes sense and where there’s room, multi-use trails should have separate paths for walkers and cyclists. Northern Europe has got this figured out – and even Chicago’s Lake Shore trail has some divided stretches that work pretty well. It would be nice for some of our region’s trails as well. 7. Any thoughts about Capital BikeShare? Also, if you use it, what kind of trips do you use it for? I think that CaBi has been a success and affirms the notion that multi-modal transportation (metro-bus-bike-walk) works and works well. I have colleagues who use it regularly and can frequently be seen checking their smartphones for dock/bike availability before leaving the office for a meeting across town. I’ve never had the occasion to use a CaBi; they haven’t really expanded out West very much (sadly, not a lot of demand in the Palisades); and around downtown I like to walk. Chris takes to the 15th Street Bike Lane. @sharrowsDC button attached to the commuter bag! Be patient. It can be easy to get frustrated with motorists and pedestrians every time you hop on your bike, and this frustration will wear on you to the point where you won’t be happy riding anymore. It’s happened to me plenty of times over the years, but now I do my best to enjoy my time riding and relax. One peculiar tip that I can pass along: If you have a U-lock, when locking up to something, put the cross bar against your frame (as opposed to the thing you’re locking to). If a thief is going to pry the lock, he/she will want leverage and using the frame to produce that leverage will likely result in a damaged or bent frame which is no good to the would-be thief (except for parts maybe). It’s not much of a deterrent, but it might help now and then. I’m grateful to have the kind of cycling environment that I get to share with my daughter. It’s a warm community with welcoming places to ride. 11. What did I not ask about #BikeDC that you want to add? While you can certainly do plenty of riding (utility, commuting, sport) without running into too many other people, I’d encourage new-to-town riders (or those who have been riding solo) to seek out the community of cyclists. Ever since I’ve found a couple different groups, I’ve been much more energized about getting out and riding and spending time on the road with other people. There are plenty of different groups out there for all tastes and skill levels, be it the randonneuring aficionados or the Hains Point trainers. As I’ve learned, a friendly hello and some small chat- even with a cyclist you’ve just encountered and don’t know- makes the ride much more enjoyable. It can be anything from asking a tech question of one of those Hains Point lappers to finding out about the route in from Cumberland, Maryland, from a mud-covered C&O Canal rider. I agree! 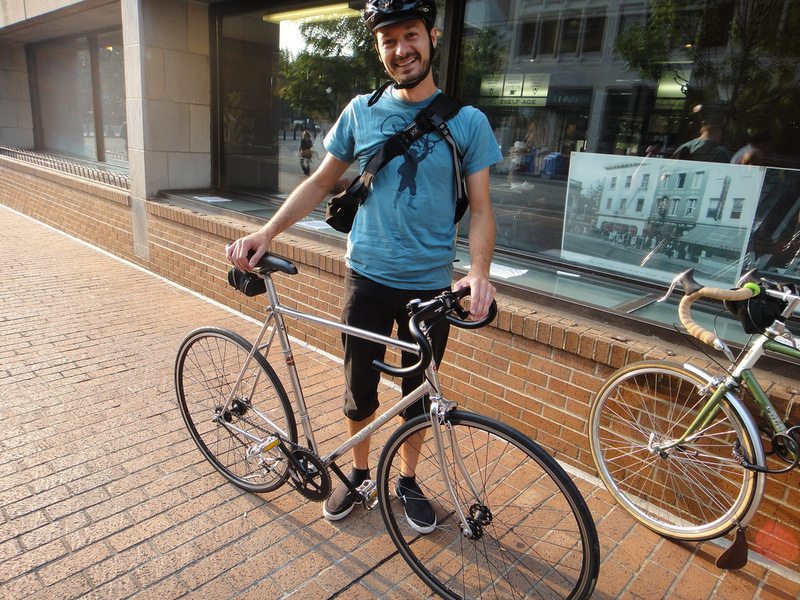 Good #BikeDC company improves a ride and puts a friendly face on the city. 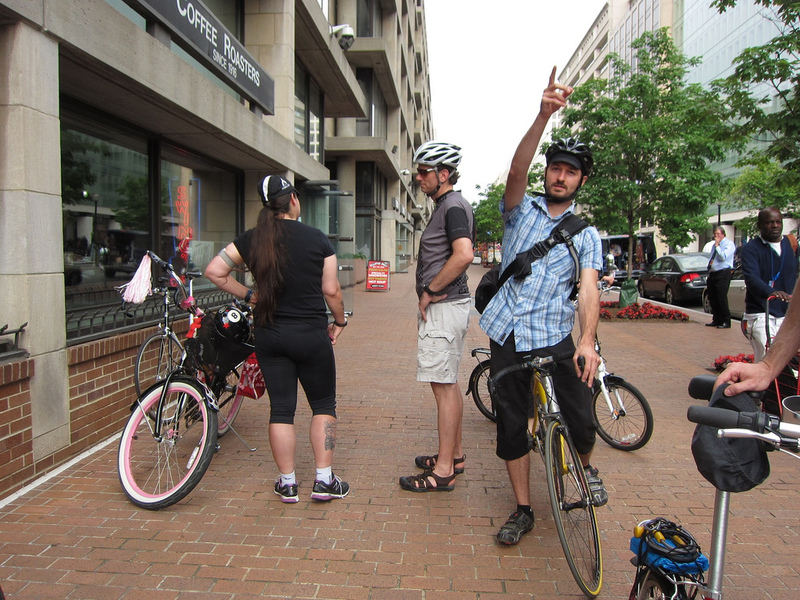 Thank you again, Chris, for being part of #BikeDC Speaks! I’m learning so much from these #BikeDC Speaks series– getting different perspectives on biking in the city, as well as different tactics. Thanks everyone!